Along the once busy shotengai (“shopping arcade”) many of the rolling metal shutters are down for good. Even though Saenba shopping street faces Kochi’s main street, “Densha-dori,” it suffers from severe problems like the decline of visitors and shops. However, one small building gives a gentle light. “Welcome back!” the owner Mr.Shinoda and Ms.Mori said to their guest. The guest house Tomarigi, opened in March 1st, 2018, is now welcoming guests from all around the world. 60~70 percent of recent guests at the Tomarigi guest house have been foreigners from America, Norway, Australia, France, Israel, Czech and the like. The guest house Tomarigi is gathering not only travelers but also local people. This is a significant role to play because Saenba shopping street is getting poor gradually. Only a few people walk through the shopping street, most of the shutters are closed, this situation would show a faded sign of Saenba shopping street. In 1978, Saenba shopping street had 130 stores, but 30 stores are there now. Also, the number of visitors reached a peak of 1400 / day in 2001, but 700 visitors were last year. 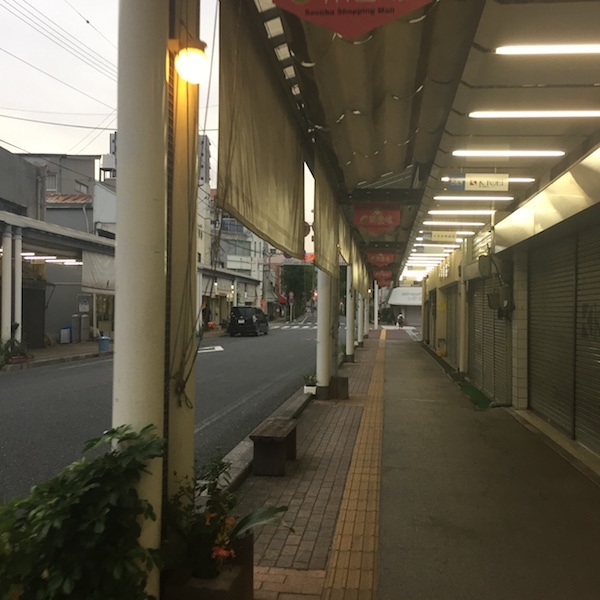 “This shopping street faces a problem of depopulation, but I thought that there is room for further improvement,” said Mr.Shinoda. He felt a notable trend will come to Saenba shopping street thanks to new stores. Actually, new stores are coming soon with the current trend. In general, it is said that a guest house is just for travelers but not for Tomarigi. 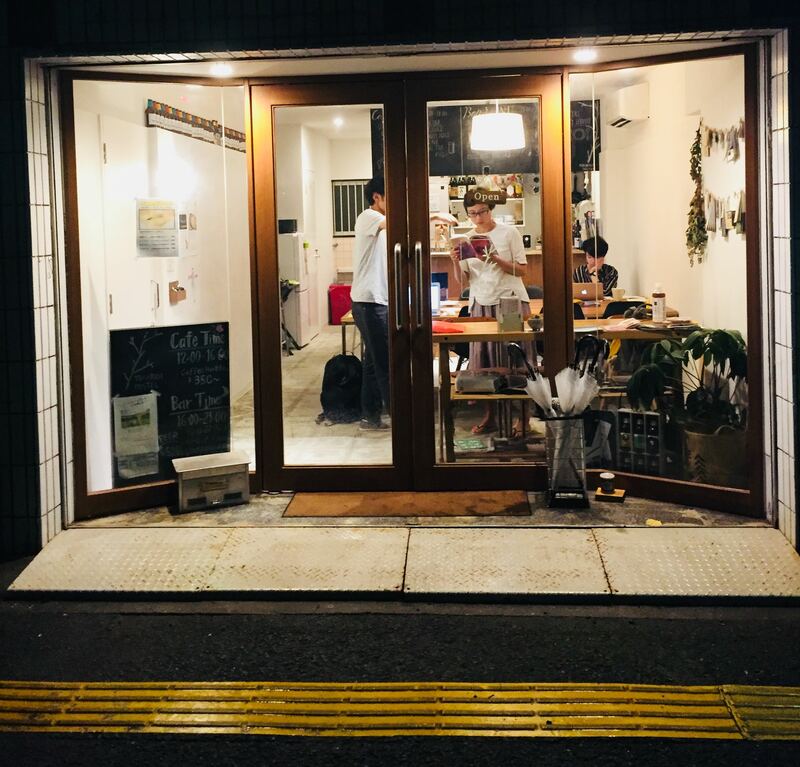 Tomarigi runs a café & bar on the first floor, and various events are held there. “Hello, everyone! My name is Andy,” Teacher Andy from America said. With his yell, “ Andy-no-Eigotabi” starts. 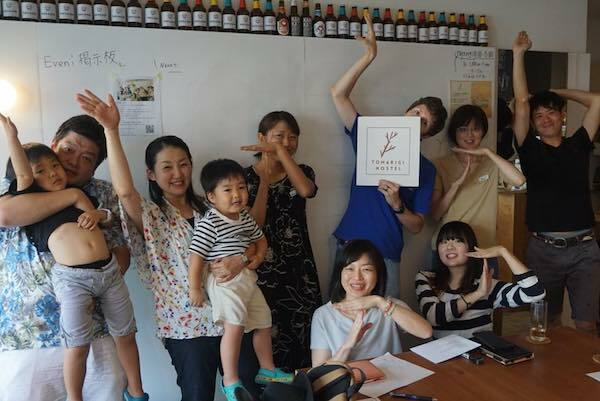 His lesson is held in every month and it gathers people who want to study English from children to adults. In this way, various people visit Tomarigi. It can be said that it is not a typical guesthouse’s style. with inspiring books. Mr.Shinoda stocks books from his friends’ recommendation. 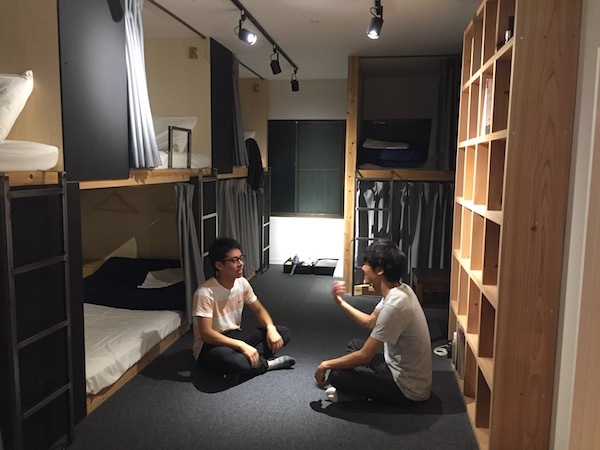 “When I was a 4th-year university student, I traveled around Japan use guest houses, and I found that there are a lot of ways of life through meeting unique people who have interesting backgrounds,” Mr.Shinoda said. He made the guest house Tomarigi from his experience. In this way, it is true that Tomarigi consists of travels, people, books, and life. “Tomarigi is no longer a general guest house–in a good way!–because we welcomed not only traveling guests but also ordinary customers who use the café and bar. I hope this guest house becomes a hostel where people can enjoy change and discovery,” Mr.Shinoda said with looking around Tomarigi. I did not know about Saenba, but I understood this arcade’s history and the preasent status of affairs. I want to go new store!!! I really liked the pictures you have taken and the title is very attractive. By reading this article, it shows how much difficulties they have in the shotengai. 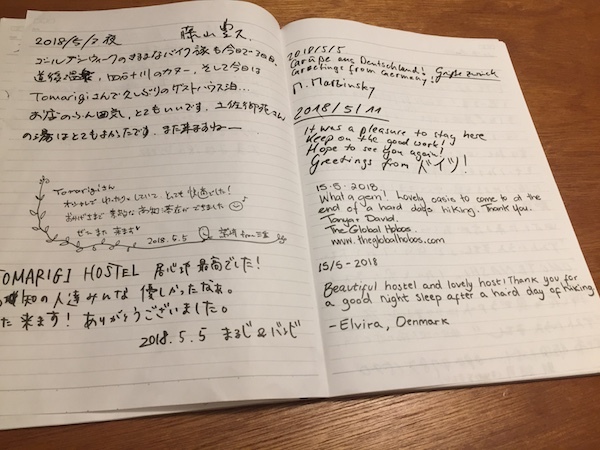 Also, I like the way the visitors write a note before they leave to say that they will come back again. I seldom visit Saenba, so today, I knew about Tomarigi for the first time!